So after way more deliberation and angst than should have strictly been necessary, I finally settled on what nail art to do for Halloween and had a go at Sally, from The Nightmare Before Christmas! These really were a challenge for me, as I'm still so rough and brand-new at trying to paint recognizable faces, but since there are only so many stitched up, blue-skinned redheads in the Halloween catalog, I figured I could at least communicate who I was trying to paint...and even if my Sally Skellington looks like the love child of Willow Rosenberg and a Muppet, I really enjoyed stretching myself and trying something new! The base for these is Essie Mint Candy Apple, over which I sponged some Essie Borrowed & Blue and Bikini So Teeny (...not that you can see that anymore, since it all blended together when top coated >_<). For Sally's dress, I did a quick and dirty colour block of Skinfood PK202, Bourjois Jaune trendy, and Skinfood BL514. Everything else is a whole bunch of acrylic paints. After yesterday's galaxy nails I thought it might be fun to put a Halloween-coloured spin on another nail art technique and decided to go with an ikat manicure--and I just love how it turned out! Ikat nails are so much fun to do, and I think the design lends itself really well to Halloween's colours, making them a great alternative this week, especially for nail art novices, people who don't want to be too "on the nose" with the holiday theme, or anyone who, y'know...likes ikat...yeah, that sentence got away from me there. Nothing to see here, people! Moving on! I used a lot of the usual suspects in these. OPI In My Back Pocket (orange) and OPI Planks a Lot (purple), and nail art stripers in black (Orly Jet Black) and white (Sinful Colors Bad Chick). The newcomer in today's group was Sinful Colors Innocent, which surprised me by being quite possibly the least fussy lime green I've ever used. Talk about panic, though--after whinging earlier this week for the bajillionth time about how my white polish went yellow when the lime green underneath bled through, I completely forgot to top coat my ring finger before adding the white! So much potty-mouth ensued...until I realized it wasn't yellowing! At all! Clearly this was a Halloween miracle. The Great Pumpkin be praised! I wanted so much to do something Star Trek or Doctor Who for this week's "Space Inspired" manicure, but I just couldn't shake the Halloween mood. Not that I tried very hard, given how long it took to get here again this year in the first place, so I gave it a good three or four seconds of intense deliberation and decided to go with Halloween-coloured galaxy nails. Whee! 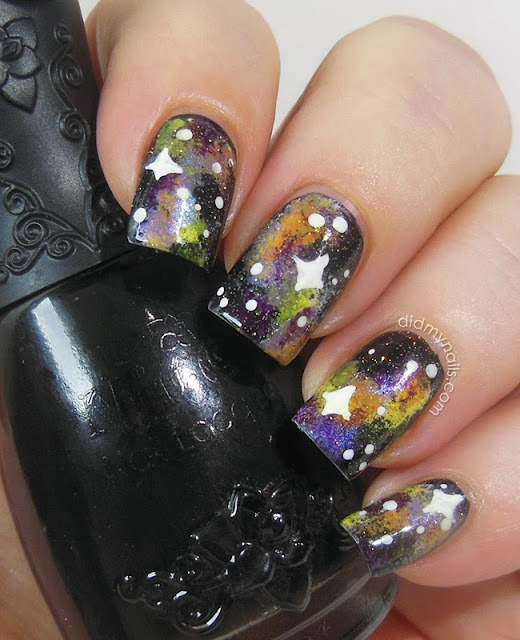 Galaxy nails are some of my favourite nail art to do. You never know just how they're going to turn out, and you can do them with just about any colours you want. My Halloween-hued galaxies started with a base of Nfu Oh 132 (black), over which I sponged a little Sinful Colors Snow Me White, then OPI Need Sunglasses? (yellow), Illamsaqua Radium (acid green), OPI In My Back Pocket (orange), OPI Planks A Lot (dusty lavender), Wet n Wild Disturbia (dark purple), and OPI The Color to Watch (iridescent purple duochrome). After the sponged bits were dry, I hit my nails with China Glaze Golden Enchantment, gold-tinted sister polish of silvery Fairy Dust. Then came a few minutes of staring at the twinkly little stars... And I'm not sure how long that part lasted, but after I came out of the glitter trance (I'm distressingly susceptible to them) I dotted on some white stars and added one big, twinkling one to each nail with a striper. In the end I don't know how Halloween these galaxy nails really are, but it was fun to try them out with some different colours. 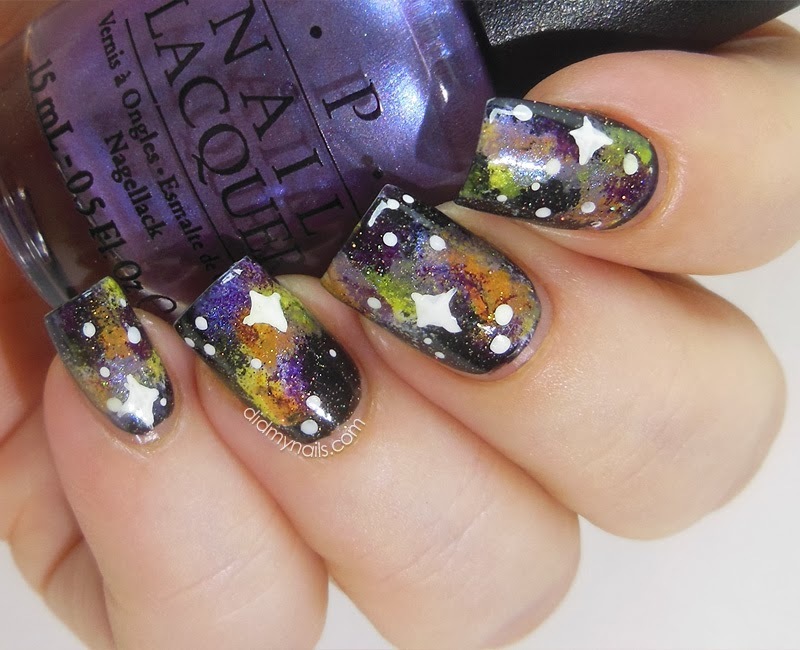 Please swing by some of the other TT blogs for more space-inspired nails! Edit: I just realized this is my 300th Post! 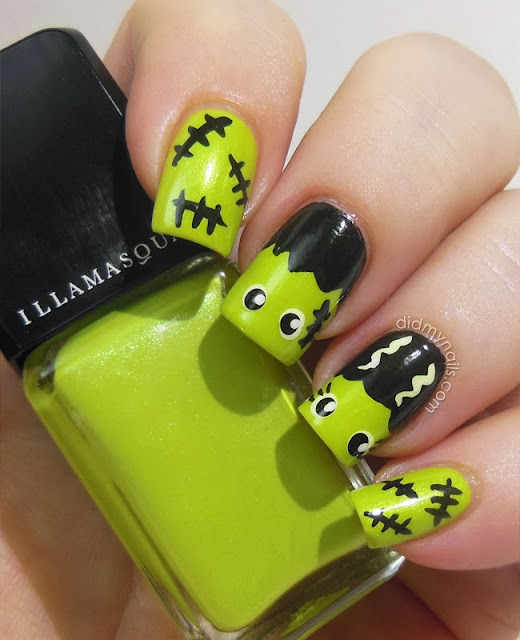 Illamasqua Radium went on my Wish List the second I saw this precious Bride of Frankenstein manicure by Kayla Shevonne, and I didn't want to let this Halloween go by without trying some Frankenfamily nail art of my own. I was lucky enough to get Radium as a gift from Maribeth a little while back, and dang, do I absolutely love it. Thanks, MB! I'm partial to lime greens--the more toxic, the better--so I'd adore it for the shade alone, but the shimmer is just bananas too. For the actual nail art, I did the stitches, hair, and eyelashes with my darling Orly nail art striper (Jet Black and Crisp White) and dotted the eyes with another black and white I had sitting around. I did remember after my Halloween faces last year that I need to clear coat between lime green and white if I don't want the white to go all yellow, but even with a generous application of SV--with the Bride's hair, even, on top of that!--I still had a bit of yellow tint. Nothing manicure-ruining or anything, but I still indulged in a spot of heart-felt profanity. That and a couple of other tiny details had me debating whether to post these when Husband got home from work and literally went, "Awww!" at my nails, so Husband, this post's for you. Happy Halloween! Pumpkins and Ghosts and Saran Wrap--Oh, My! 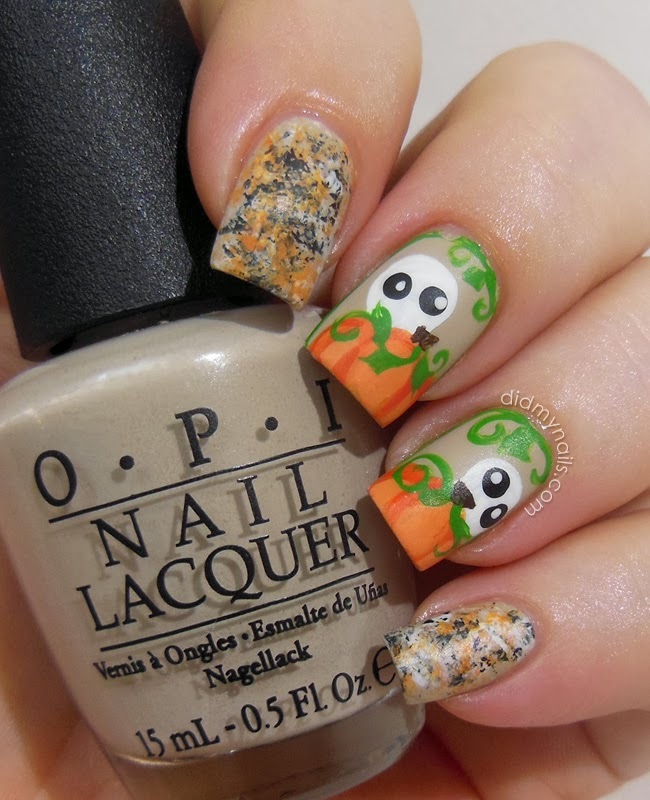 Just like last year I've been slow on the Halloween nail art uptake. Also just like last year, the heat has only just broken here at the very tail end of October. Coincidence? Yeah, not likely. Now that it actually feels like it could conceivably pass for autumn in these parts, though, I'm finally finding a little bit of Halloween spirit. All I really had in my head when I started these was, neutral base, get some pumpkins in there, and maybe mix it up a little with something else. 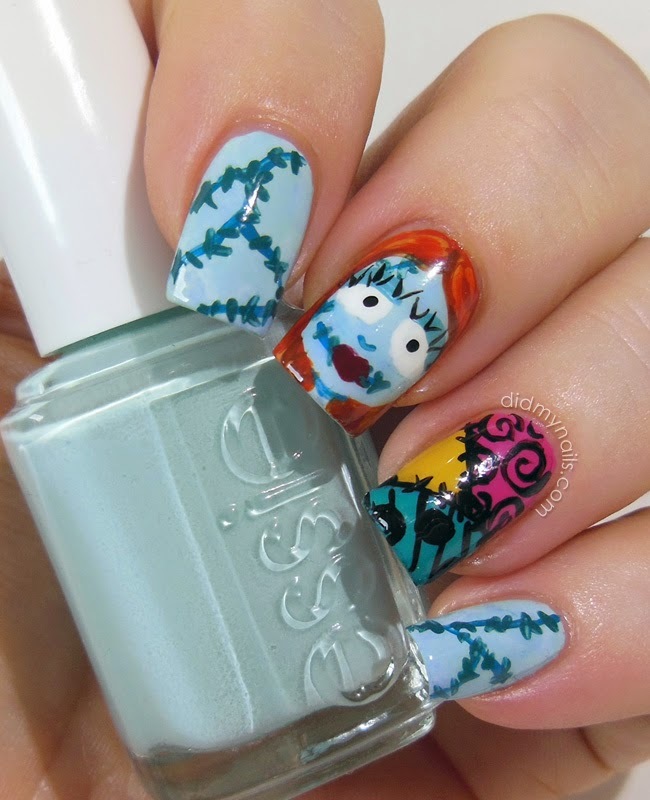 OPI Did You Ear About Van Gogh?, one of my favourite neutrals, served as the base. Then a quick Google of "adorable pumpkins" turned up this cute craft project, which was both adorable and relatively simple to translate it into nail art via acrylic paint. I also embellished the vines a little for bonus pumpkin patchery. The ghosts' eyes were dotted with polish, which I had out anyway to do a little saran wrap treatment on the un-pumpkinated nails with OPI In My Back Pocket (orange), Wet n Wild Ebony Hates Chris, and Sinful Colors Snow Me White. Once it was all dry and top coated, I liked it a lot but thought it was missing just a little something, so I gave the nails another pass with some butter LONDON matte top coat and liked it a whole bunch more. 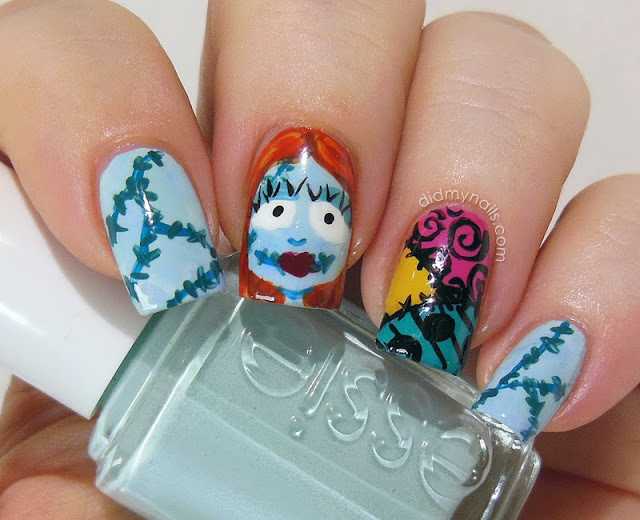 With maybe twenty minutes left before November gets here, I have a few more ideas for some Halloween nails, but none of them is leaping onto my fingertips at the moment. I'm going to mentally cross some of those fingers, though, and see if I can't find a little more of the seasonal spirit. Wish me luck! Happy Almost Halloween! 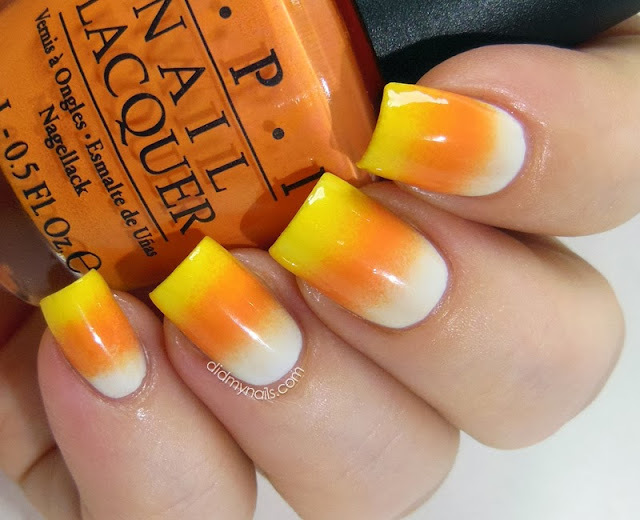 With just a few days left before The Great Pumpkin makes his annual visit to all the pumpkin patches of the world, it's also time for this month's Wayback Nails, so I decided to go with the nail art that finally got me into the Halloween spirit last October and do another candy corn gradient! Just like last year, I hit my trusty trio of OPI My Boyfriend Scales Walls, OPI In My Back Pocket, and OPI Need Sunglasses? for this Halloween-hued gradient. In My Back Pocket, the orange, is still chugging along, but true to forecast I'm on to new bottles of both the yellow and the near-white since last year...and I'm actually surprised to realize it's been well over a year since I fell in love with MBSW, aka The Greatest (Almost) White Polish EVAR. I can't believe I missed our anniversary, baby, but you still rock my world. This past year has actually made quite a difference in Halloween's prevalence here in Hong Kong. It's still nowhere near as huge as in the US, but the grocery stores have put up Halloween candy displays (containing actual bite-size Western chocolates, which, bonus! ), and the grocery downstairs from me even has a decorative mini-pumpkin/gourd selection! I think Hongkers might have finally realized that Halloween is a wonderful opportunity to sell people things, and if you can do that while dressing your kids (erm, selves...) up in cute little outfits, then you're pretty much going to be a lock in this town. Sadly, the stores have yet to discover the seasonal magic of candy corn. I was so deliriously excited when, while I was in the States this summer, Lauri sent me her amazing CrowsToes One Mad Crazy Summer collection. I couldn't wait to start swatching these beauties immediately! And then there was travel and nail breaks and womp, womp, womp, and I've taken waaaay too long to get these photographed. Fortunately, Lauri's collections look fantastic all year long, and what was a truly awesome summer collection is also rich enough to carry straight through autumn and winter as well! 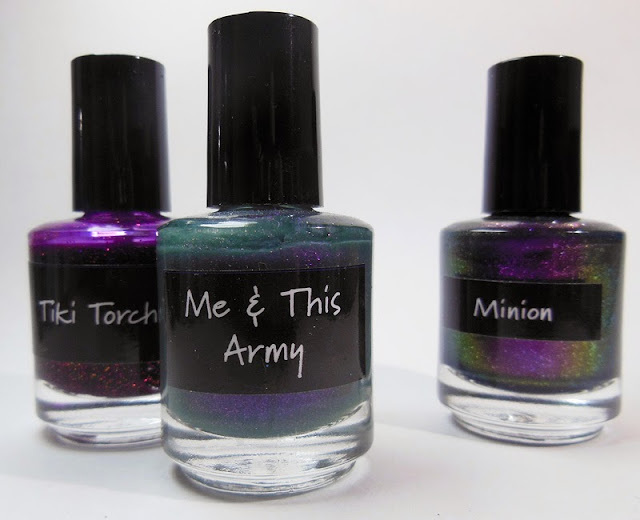 Today's post features Minion, Me & This Army, and Tiki Torch, three of the nine polishes in One Mad Crazy Summer. Please join me for pics and raves, after the break! 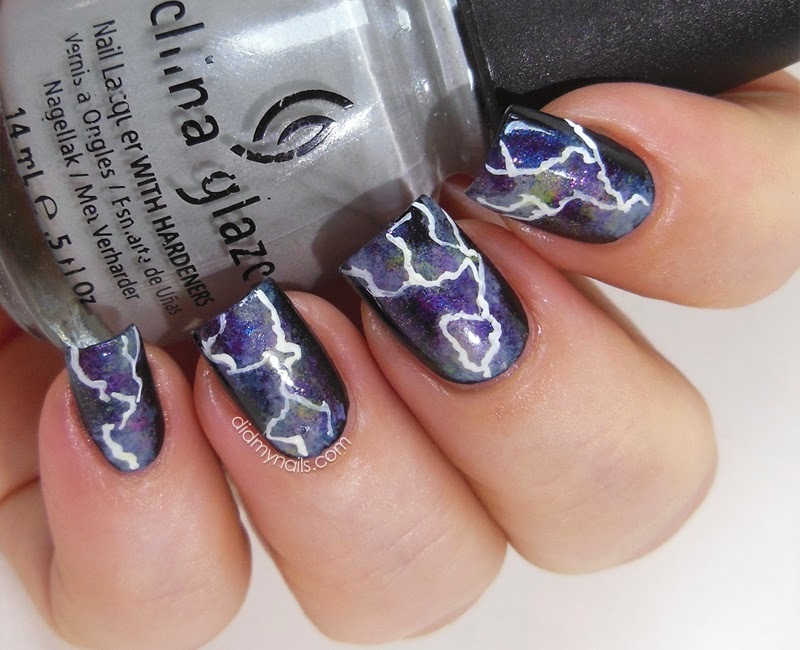 With a Twinsie Tuesday prompt this week of weather, there was only one thing I wanted to do, and that was lightning nail art. Not only has it been on my To-Try list for a while, but other than waking up to a crisp, bright morning full of white, fluffy snow, there really isn't much higher on Weather's Greatest Hits for me than a raucous nighttime thunderstorm. Without knowing of a tutorial for these, I figured they were probably the same basic idea as galaxy nails. So, starting with a base of black, I sponged several polishes along the general path ("General Path...") that the lightning was going to take. Color Club Alias and Orly Mysterious Curse gave some nice duochrome and shimmer to the night sky, and China Glaze Pelican Grey was a nice, light shade for the sort of cloudy background that gets lit up. I also sponged a few faint patches of green, pink, and purple, which ended up being really subtle, but I liked the bit of colour they added. 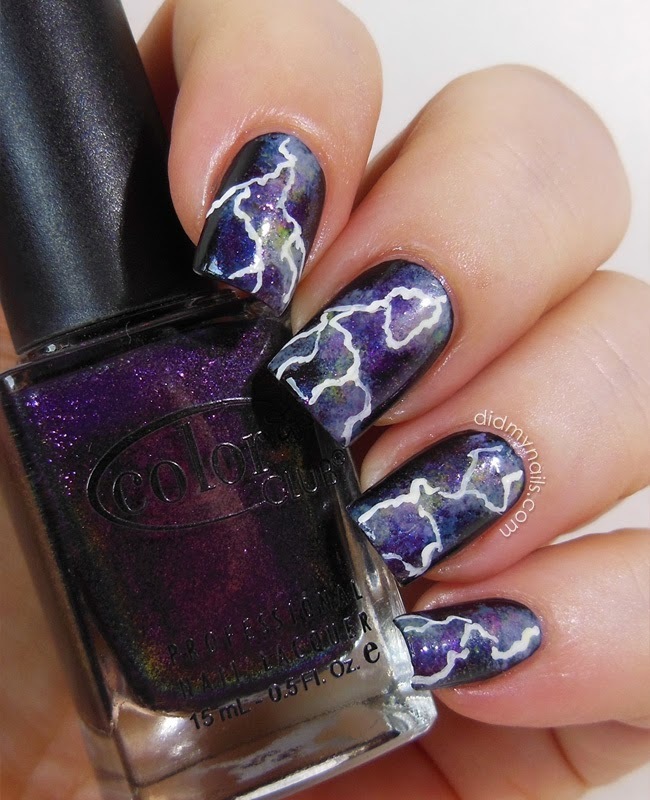 Then finally, the lightning bolts were my trusty Orly nail art striper in Crisp White. I'm not even sure what it is about thunderstorms that I love so much, but I've always found them oddly relaxing. Tragically, as fabulous as Hong Kong is in many ways, it is sadly lacking in this area. It most definitely rains--we have a genuine monsoon season, even!--but the sky just sort of gets on with pouring down in a quietly efficient, almost businesslike sort of way. There's no percussion, and there's no light show, and it's absolutely boring. Not to mention that when there's been a fancy-dress murder and you want to call all the suspects into the drawing room, it's really hard to work up the right sense of dramatic tension without some decent thunder and lightning! Oddly enough, my grandparents' newspaper back in the US seems to forecast thunderstorms for Hong Kong on a near-daily basis. It's such a tease. For more weather-inspired manicures, please check out some of the other Twinsie Tuesday blogs! I haven't completely given up hope of finding the Halloween spirit (aka The Great Pumpkin) before this month is over, but in the meantime, I picked up a couple of polishes from OPI's 2013 Holiday Collection. Described as a "spiced coffee," this is OPI Warm Me Up. OPI Warm Me Up was richly opaque in two easy coats. Less coffee to my eyes than yummy dark chocolate, it also has a gorgeous, silvery shimmer that gives some vibrance to this deep brown shade. It's unconventionally dark for a Christmastime collection, but in the usual sea of holiday reds, I liked Warm Me Up all the more for being a little unexpected. OPI Warm Me Up makes me think of some ridiculously decadent "Death by Chocolate" dessert that's all moist and rich and gooey and delicious. It's something a little different from the usual holiday polish, and it's absolutely gorgeous. I wanted to do some nail art for this last day of Pink Week, and I had a very specific idea in mind about what it was going to be. Then that idea led to a little embellishment, which led to a simplification, which led to a different approach entirely, and before I knew it I had wandered into an abstract brushstroke manicure. It's been a long time since I did a brushstroke manicure (wow, almost a year to the day! ), but I loved this one so much that I'm totally going to pretend it's what I'd planned to do all along. I'd also love to pretend it's the end result of hours of painstaking, careful work, but it's super easy and lots of fun. I need to remember to do these more often! A whole range of pinks went into the stewpot. Light to dark, there's OPI My Very First Knockwurst, Revlon Cafe Pink, Skinfood PK006 Pink Milk, OPI Elephantastic Pink, Revlon Passionate Pink, OPI Kiss Me On My Tulips... and a dark pink Bourjois whose name has rubbed right off the label. If you haven't done a brushstroke mani before and want to give it a try, I highly recommend Veronica's tutorial! Pink Week: China Glaze Hello Gorgeous! Nearing the end of Pink Week, it seems only fitting to include a polish I've had in my untrieds for a while now; this is China Glaze Hello Gorgeous!, from the 2012 United in Purpose (Breast Cancer Awareness) collection. More swatches and a side of ramble, after the break! After yesterday's deeper, darker pink I decided to swing around in the other direction and show off a pale but fiery shade that spent some time on my wish list before the beautiful Brandi was sweet enough to send it my way as a birthday gift. This is Barielle Buddha-ful, and it is amazing. Barielle Buddha-ful is a milky, jellied base of palest pink that's overflowing with brilliant, duochrome flakies that flash from light blue to light green. Just one generous coat over OPI My Very First Knockwurst, had me swooning! The undies lent it a little pinker hue overall, but they really are a great match. With the help of the flakies, the milky base could probably build to opacity in 3 or 4 coats, and if you don't mind VNL, it can look very sweet with just a couple of coats on its own. Personally, I like it layered. And I love that while I'm more used to seeing flakies flaring over a darker base, the ones in Buddha-ful still dazzle over this light pink too. As you may know, this Pink Week has been a joint effort among several bloggers to promote breast cancer awareness. We felt that was more important that promoting our blogs, so we haven't included a list of links, but we have included a little information each day that has hopefully been food for thought. There are healthy choices you can make that may help lower your risk of breast cancer, including exercising, limiting your alcohol intake, and maintaining a healthy weight. 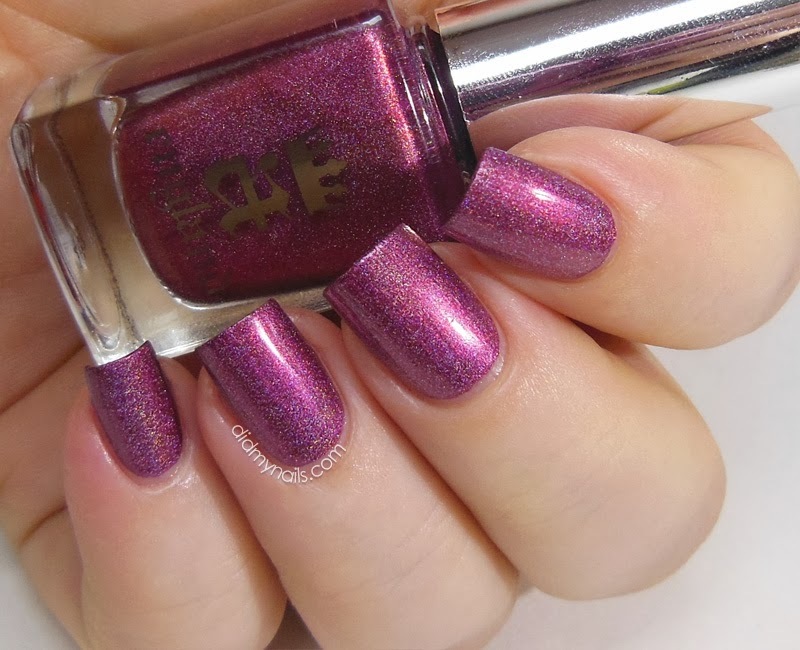 I thought I'd break up the bright pinks of this Pink Week with a deeper shade and share another polish I'm swatching on behalf of Dazzled--another beauty from the Burne-Jones Dream Collection, this is a-England Briar Rose. a-England Briar Rose is a deep, wine-leaning pink, dusty but strong and very rich. Like the other a-Englands I've tried, it also has the prettiest holographic shimmer that adds a brilliant texture and depth without stealing the show. Also like the others, the formula is fantastic--easy to control and practically opaque in just one coat. Honestly, I sound like such a broken record when it comes to a-Englands, but what else is there to say? Gorgeous, gorgeous, gorgeous. a-England is available at Dazzled, which ships internationally, and for one more day--through October 17th--you can get 10% off at Dazzled with my discount code dmn10. In addition to being Day 3 of Pink Week it's also Twinsie Tuesday, and today's theme is our most hated nail trend. If I had to pick just one and only one it would probably be an exaggerated nail shape like duck feet, bubbles, or super-stilettos (like, the crazy long ones that look like they would snap off if you bumped your fingers into a thicker than average piece of paper), but I couldn't figure out how to alter the shape of my nails that dramatically for just one manicure without risking major damage ("Major Damage"). So, I reined the imagination back in and focused on nail polish, and I realized there really is a polish trend I am super hostile towards...and it is most definitely available in pink! I'm talking about frost. Please join me for ranting and more pics, after the break! Continuing this week on behalf of Breast Cancer Awareness, I have swatches of a fabulously fun pink, Pahlish Sugar Venom, from the Pahlish Coney Island Queen Collection. I knew I was going to like Pahlish Sugar Venom, but I had no idea how much! The metallic red glitter is wonderfully suspended in the bright pink base, and the formula layers up very well. After a somewhat patchy first coat, the second actually built to plenty of opacity for daily wear, but I hit it with a third for the camera. I'm also impressed that while building so well, the crelly base still manages to allow the bits of glitter to peek through the coat above, giving it all a gorgeously rich density without getting even the slightest bit chunky. It's quite a balancing act, and Pahlish has pulled it off beautifully. This is actually an interesting shade of pink to try to nail down. It's bright as bubblegum but with a hint of softness. Neon-adjacent without going garish, and while it's nowhere near pastel it still manages to make me think of smoothies and strawberry yogurt. Based on how very happy I am with Pahlish Sugar Venom, I'm definitely going to look into more of the Coney Islands! Pahlish can be purchased at Pahlish.com and Llarowe. As I mentioned, several bloggers have joined together for this Pink Week, hoping to encourage breast cancer awareness and to share information. One staggering breast cancer statistic is that 1 in 8 women will be diagnosed with this disease. However, the "1 in 8" refers to a woman's risk over the course of her entire lifetime--her later years contain that highest risk. In her 20s, the figure will be much lower than that, but it can and does strike women of all ages. Please talk to your physician about your risk factors and what early detection screening approach she recommends. This week, along with several other bloggers, I'm going to be posting in pink, in the hopes of promoting breast cancer awareness (which we feel is more important than promoting our blogs, so we won't be including a list of links). I decided to kick off Pink Week with some sponged nail art! I love this look--it always delivers such a rich, textured-looking result that looks like you spent way more time doing your nails than you really did. No, no, wait! I mean, I laboured for hours to get these done, and I had to have a bit of a lie-down after. Absolutely grueling! (Yeah, no. It's mostly just poking your fingernail with a sponge.) I also got kind of an '80s vibe off this particular manicure for some reason, which I can't explain, but I'm gonna pretend I totally mean to do that, because the '80s were, like, totally radical. I started these nails with Revlon Cherries in the Snow, a total classic that leans very strongly pink on me. Then on top of that, I took some little ripped bits of cosmetic sponge, a whole bunch of pinks, and went to town, dabbing all around, making some areas lighter or darker, and not especially trying to blend them together at all. I'm not even sure how many different pinks I used, but the most prominent ones were Skinfood PK202 (Vita Line), Skinfood PK006 (Pink Milk, Milk Creamy Nail Line), and Nfu Oh 150 (pale pink). I also threw in some OPI Planks a Lot, as well as OPI The Color to Watch and OPI Significant Other Color, for some contrast and a little iridescent sheen. Breast cancer is the most common cancer among women worldwide. Early detection and treatment can greatly improve your outcome, though, so please learn how to perform a self-exam, do it every month, and encourage the other women in your life to do the same. This knowledge really is power! Today I have another gorgeous glitter that was sent to me by Shimmer Polish. Packed with teal and blue and wonderfulness, this is Jasmine! I decided to do a gradient of Shimmer Polish Jasmine over Essie Naughty Nautical, and I could not have been happier with the results! This glitter thoroughly delighted my eyeballs. And it was easy to work with too, which is always an extra bag of awesome. Shimmer Polish Jasmine is a teal mix, with blues and a little green, and some tiny squares (love! ), and bits of red and orange that serve as a fabulous contrast and make the whole blend look even richer! The light just danced off my fingertips when I wore this--both Shimmers I've tried so far (this and Fanny) have looked like little crushed gemstones on my nails! I really was looking forward to trying this brand, and so far they've been utterly amazing. Shimmer Polishes can be purchased here and via Etsy, as well as at Dazzled (where you can use my discount code, dmn10, for an extra 10% off until October 17th). I am crazy, sugar high, kid-at-Christmas excited right now, because Lauri sent me the latest CrowsToes collection! I'm really looking forward to sharing it, but I have some things I do need to post first... including just a little more springtime Crow! Lauri noticed these hadn't made it over with the first batch (see parts I, II, and III) and sent them along, and I'm so happy to be able to share them. It's a duo of purple sister polishes, L'il Miss Sunshine and L'il Miss Cyanide. L'il Miss Sunshine is a bright, medium purple that's packed with shimmering, duochrome microflakies that flash from silver to blue. Her partner in crime, L'il Miss Cyanide, has a much finer shimmer that flares from fuchsia to a brilliant acid green. Please join me after the break for more swatch pics and details! 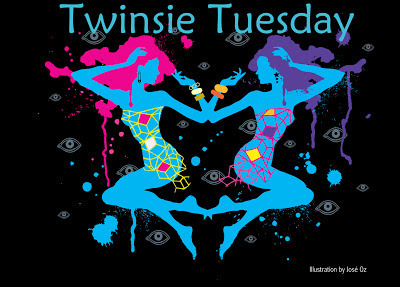 With a Twinsie Tuesday prompt of "cutesy and girly," I knew exactly what I wanted--nay, needed--to do. Having recently, wholeheartedly embraced the wonder that is My Little Pony (like you do when you're a grown-up), my careful and deliberate consideration of the theme roughly went, "Yii! Ponies! 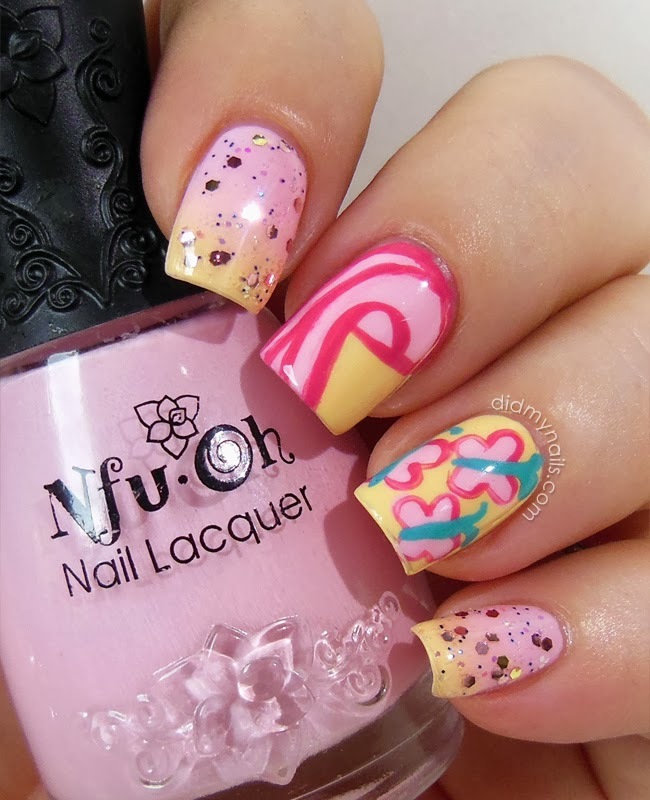 Fluttershy is girly and she's so cute, and OMG, Fluttershy nail art!" Yes, my inner child has staged a coup and is now in charge of the brain. I regret nothing. Because ponies! My middle nail is Fluttershy's swooping mane, done with polishes, then outlined with acrylic paint. 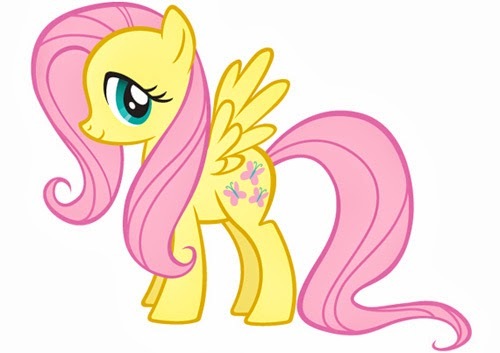 Likewise, her butterfly cutie mark (yes, that's what it's called. a cutie mark. shut up.) 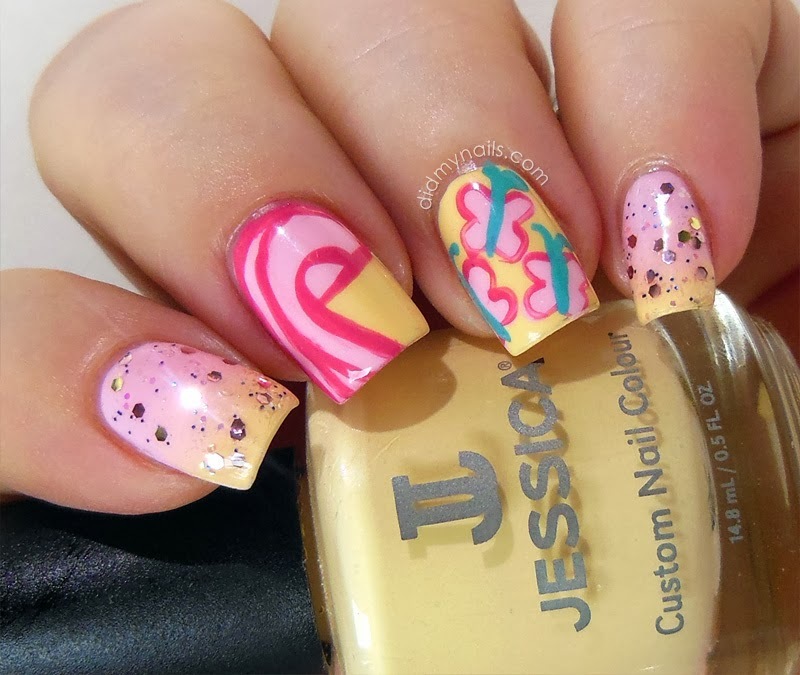 is pink polish dotted over the yellow with acrylic paint details. The other fingers got a gradient of the two main polishes with Spoiled Jewel Heist glitter. Pink and green with tiny highlights of blue and a hint of iridescence, Jewel Heist really needs to be dabbed to get decent coverage, but the colours are so adorable. Hopefully these fit the "cutesy and girly" bill! On a tangentially related note...new site layout! I just felt like it was time for a little less of a springtime look...and then a day after I take down my pink butterfly layout, I go and do pink butterfly nails. Womp, womp. But still, I like the new digs. For now. No telling when I'll get that itch, though--sometimes it hits me in the middle of the night, and suddenly, Must Change Layout! NOW! And then I spend the next 24 hours obsessing over pixels instead of watching My Little Pony. 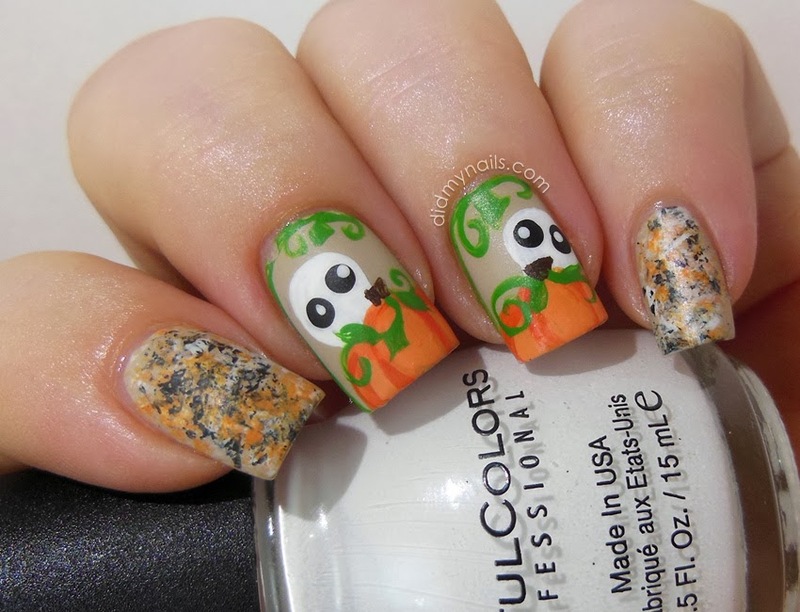 Really looking forward to seeing my fellow Twinsies' nails all cutesy and girly this week! I had some pretty big expectations going into my first Shimmer Polish, and you know what it's like when you're all excited about something and you try to talk yourself down and prepare for disappointment...and then you didn't need to do that because the thing ends up being all kinds of awesome?! Welcome to Shimmer Polish Fanny. Like many of the Shimmer blends, Fanny is a complicated lady. Predominantly pink and purple, it also has highlights of, I think, red and maybe light blue and...other things...honestly, I can't even. It's all just glittering away up in there and looking fabulous--and being all the more so for its fantastic formula because this is just one coat of over OPI We'll Always Have Paris. Honestly, just the one. And there's no trick to applying it either; it brushes on smooth and even. I really couldn't tell you how many different little pieces of awesome go into making up Shimmer Polish Fanny because it's so gorgeously sparkly that I don't know what's part of the mix and what's leaning into the deep, deep base, and what's reflecting from around the room, and seriously, it's just amazing. I do know there are some teeny little rosy pink squares, which I ♥ forever. 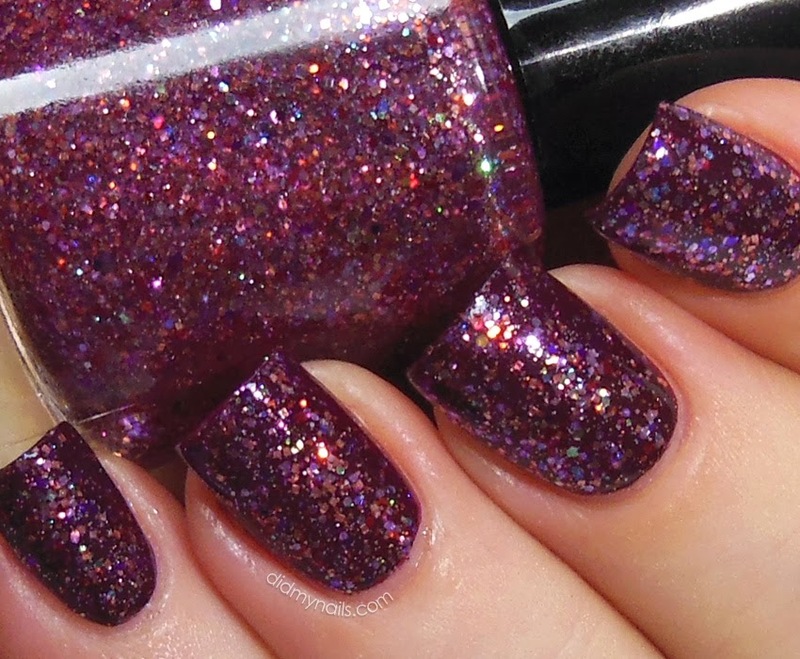 Shimmer Polish Fanny looks like you've just pressed your wet nails into a jar of crushed gemstones. If wine and jewels could have a baby, this is what it would be. So yeah, I didn't need to worry about having my expectations too high; Fanny really is just that gorgeous. Twinsie Tuesday: What's Your Sign?